This guitar lesson plan teaches the children's song 'If you're happy and you know it'. The song uses a single note melody with the occasional partial chord. A shuffle rhythm is used in this song along with muted hits to be played in place of clapping. Alternatively, instead of the muted hits you could tell the student to clap their hands. This would be tricky but can teach the student how to start and stop quickly. The lyrics are given along with the music so the student can match up the words to the notes they play. Chords are given so you can accompany the student. 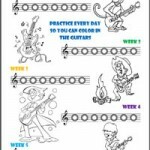 This lesson plan uses an inbuilt incentive to encourage the student to practice the song. At the bottom of the page there is a line drawing of clapping hands and a smiley face. The idea is that once the student can properly play the entire song, they have your permission to color in the drawing and to draw more smiley faces across the page. This simple incentive can make a big difference to the student's motivation. Instead of merely learning the song, they have an extra reason to practice. Even know the reward might seem trivial, it does help. Once the student learns the song and draws the faces as per your instructions, they will take 'ownership' of the song and be more likely to keep practicing it. Every time they see their colored in drawing it will remind them of the reward for practice.